One of my roommates moved out and took the internet with her, which means I haven’t been trying as many new recipes as usual. (Wednesday when the internet arrives can’t come soon enough!) Plus it’s two weeks before finals, which means I’m not cooking as much as normal. However, I did create the pepper-egg-a-muff and I am in love. You may be asking yourself: what is a pepper-egg-a-muff? I’m glad you asked! 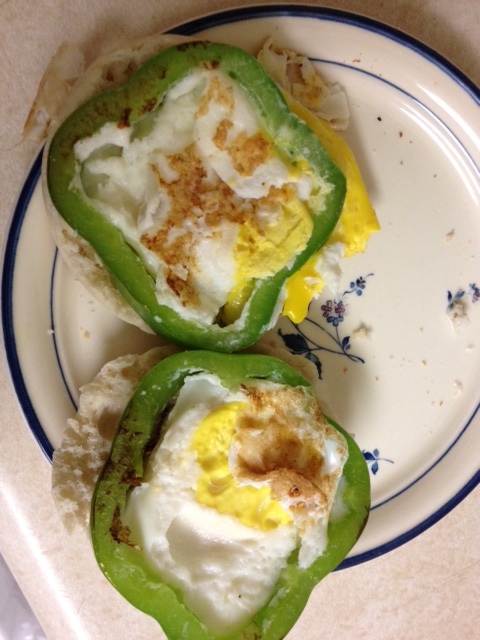 A pepper-egg-a-muff is an egg in a bell pepper ring, on top of an english muffin. When I was still living with my parents, the egg-a-muff — egg on top of an english muffin — was a staple for when we didn’t have much food in the house. Plus it works for breakfast or for dinner. 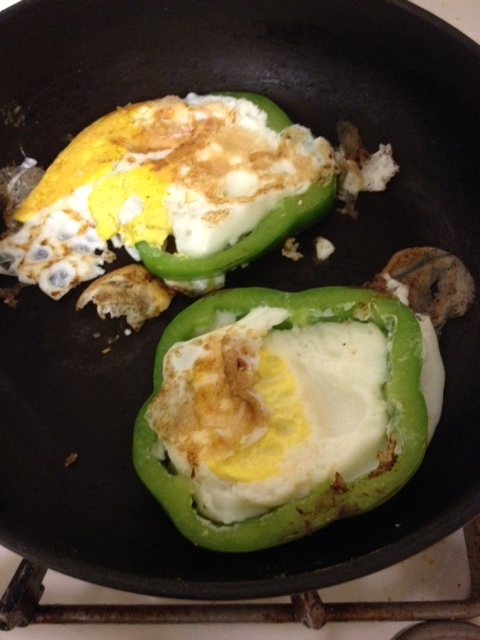 I’ve been dying to create the egg in a bell pepper ring ever since I first saw it online. And since english muffins were on sale this week, I decided to combine the egg in a bell pepper ring with the egg-a-muff to create the pepper-egg-a-muff. Who knew I’d be creating new recipes already? Step 1: After you wash the pepper, cut it in half, creating rings. The thicker the ring, the better it will hold the egg. Cut away the seeds and white skin of the pepper. Step 2: Put the rings in a sprayed pan, heating on low heat till the edges turn slightly brown. Step 3: Break one egg into a small container. Pour the egg into one of the bell peppers. Repeat. Step 4: Cook the egg until the edges of the egg turn white. I flipped my egg at this stage to cook the other side but depending on your preferences, this isn’t necessary.